A garbage disposal is probably one of the most used kitchen appliances. Everything goes down it. You don’t want all that stinky food in the trash, and you also don’t want to clog the dishwasher with food, so ultimately it all gets put in the garbage disposal. So how do you unclog a garbage disposal? There are a few important steps to follow first. It’s always important to look at the user manual. And if you can’t figure it out from there, here are some easy steps from us, the most important being the first one! Turn off the power switch. Look under the sink, close to the garbage disposal. If you don’t see it, then turn off the breaker. Determine what is causing the clog. Use a flashlight and look down the drain. 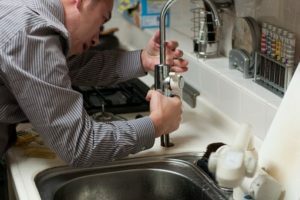 You might want to call a plumber right away depending on what is causing it to be clogged, such as a ring or something valuable. Remove the item. Always use pliers. Never use your hands and fingers. The blades of a garbage disposal are SHARP. Sometimes it isn’t just one thing clogging it up. It could be a build-up of food items. If that’s the case, use the pliers to rotate the blades to break up the debris. Once you think you have cleared the clog, turn the power back on, run the water and turn the disposal on. If you hear the humming sound, then the blades are able to turn. If water is still not draining then let the sink fill up with water and use a plunger to try to get the remaining clog out. If you’re still having a clog at this point, then the best thing to do is call a plumber. when you need a plumber, you need Wyman! Contact us today!